Last weekend I had so much fun with my college friend, Mel, who came down to visit. We hadn't seen each other in 14 years, literally since we graduated college! Thanks to Facebook, we've been able to keep in touch and share our passion for food and wine. Mel writes over at the blog Mel's Mosaic and is so knowledgeable about wine. After months of talking about getting together, she was finally able to come down to Richmond so we could catch up and cook together. She arrived armed with a couple of recipes and a couple of bottles of wine. 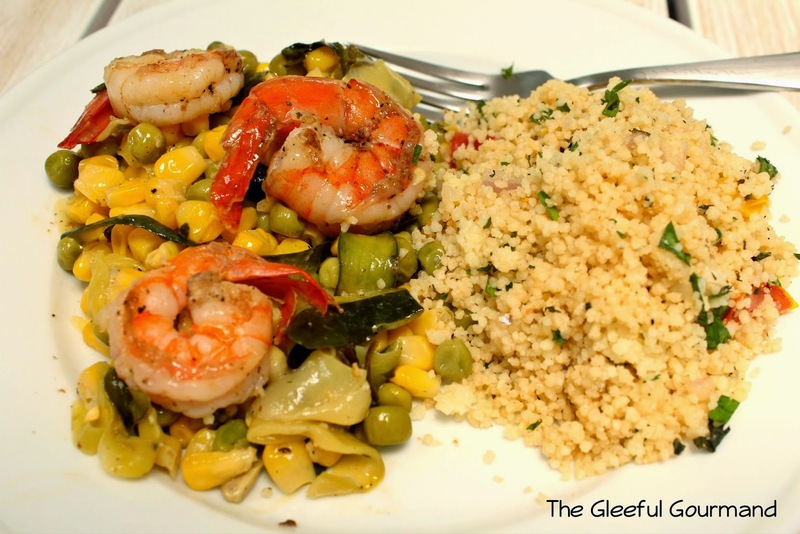 We discussed which recipe we wanted to tackle and then headed to Whole Foods prepared to shop for Health Magazine's Zucchini "Pasta" with Shrimp, and a thrown-together couscous salad. Once home, we continued with the theme and munched on fig halves smeared with goat cheese and wrapped in prosciutto (and a dollop of honey), and opened the first bottle of wine: Sokol Blosser Rosé of Pinot Noir, which I loved. Shredding the zucchini into "pasta"
It's always so interesting to cook with people I've never cooked with before. First of all, it doesn't happen that often, but when it does, I find it to be really fun. We all have different styles of cooking, and Mel and I talked lot about that (she's more inventive whereas I tend to not stray to far from a recipe). Mel, hard at work. Her awesome shirt says, "Pain now…wine later." I had never made a zucchini pasta, so I found the preparation fascinating. The recipe is super easy, and Mel taught me how to peel the zucchini into strips. What I loved most about this recipe is how packed with flavor it is. With strong bright notes from both lemon and wine (we used an open bottle of Chardonnay), it really takes over your senses with that perfect summer essence: light and luscious. I threw together a couscous salad with splashes of olive oil and fresh lemon juice, cracked pepper, parsley, mint, quartered grape tomatoes and finely diced shallots. The flavors married well to the Zucchini Pasta and we had a magnificent feast with a Penner Ash Pinot Noir. For dessert we had chocolate-chip meringues from Whole Foods, and a yummy Pear and Almond dark chocolate bar. We had so much fun, and I can't wait to do it again! Thanks for coming down and cooking with me, Mel! You can find the recipe for Zucchini "Pasta" w/Shrimp by clicking here.